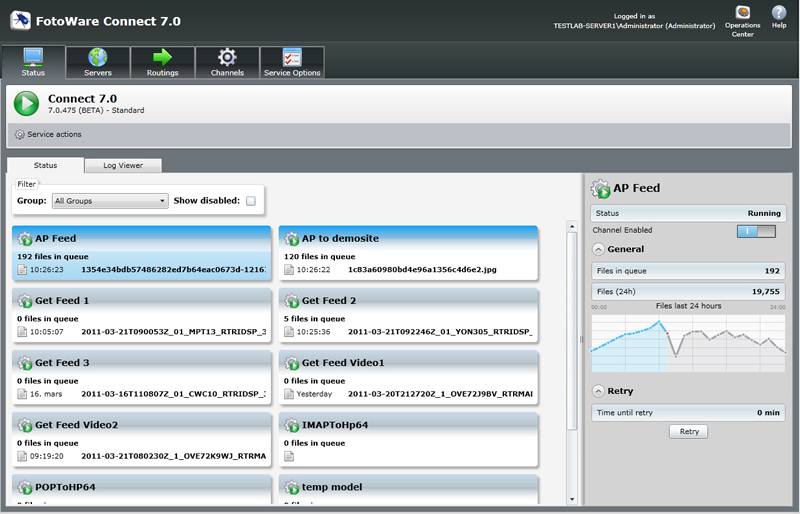 Like other products in the FotoWare 7.0 range, FotoWare Connect is entirely configured in a web interface. The web service with the Operations Center and the Connect configuration console runs on the server where Connect is installed. Members of the FotoWare Operators group may access the Operations Center to start and stop the Connect Service, while you will have to be a member of the FotoWare Administrators group to make changes to the Connect configuration. This is the home screen where Connect displays all its channels and any activity in these. The Service actions button near the top of the Status window gives you access to start, stop and restart the Connect service. Keep in mind that when you stop the service, all file transfers will stop and may affect your workflow. Hence, the service should only be stopped/maintained at non-critical hours. The channel grid shows the all the channels that are configured on the server. From here you can read out the channel name, the number of files currently in the transfer queue and the last file processed in the channel. The Group filter above the status grid lets you choose which channel groups you want to display. To also show channels that have been disabled, tick the Show disabled checkbox. The channels will light up when there is activity to make it easy to monitor server activity. A failing channel will turn red, When errors happen, you will find more information about what's wrong by clicking on the channel and checking the Status field in the panel on the right. You can get more information about each channel by clicking on it and reading out more information in the panel on the right. The Status field will indicate whether a channel is running or stopped, and will display any error messages if failures occur attempting a file transfer. You can start or stop the channel by flicking the I-O switch below the status readout. Under General you find the number of files in the queue, the number of files transferred in the last 24 hours and a graph to indicate the peak hours during the day. The Retry section makes it possible to instantly make Connect poll the channel's input folder and transfer any files that are in there. This process is normally carried out automatically - if a channel fails Connect will retry at certain intervals - but pressing the Retry button will force Connect to try resuming the transfers immediately. The Servers screen is used for configuring sources and destinations. Configuring servers separately from the actual processing channels has some clear benefits: When you configure a server, you choose the type of protocol to use when connecting to it and the folders on the server where the files should be transferred to / from. The folders can be either input (source) or output (destination) folders or both for two-way communication. When later configuring channels, you will then easily be able to choose inputs and outputs for your channels with a few clicks. Another upside to this is that if a change in the configuration requires you to change the actual placement of the input and output folders you do not need to make any modifications to the channels. Simply updating the input and output folders in the Servers area will automatically update the associated channels. The Routing area lets you set up routing rules that can be independently associated with a channel. Files can be routed by filename prefix (with an optional subfolder association table), by folder size (maximum number of files or megabytes in each subfolder) or by file type extension (also with an optional subfolder association table). Having set up the input and output folders in the Servers area and routings in the Routings area, this is where you set up the actual processing channels. It's a matter of choosing input and output folders from the preconfigured servers and associating a routing method if such is required. In this area you set up service-specific options such as virus scanner preferences.